There are several reasons which make growing rosemary very rewarding. First they are equally at home in the open ground or in pots. They are very easy to care for, simply protecting them from hard frosts and water-logging is almost all you need to do for healthy plants. Not only is rosemary very useful for flavouring many dishes but the flowers and foliage are attractive in their own right. Unlike many herbs rosemary provides a full year round crop of flavoursome leaves and the plant has foliage at all times of the year. Very few plants or herbs offer so much value for so little attention. There is very little difference between growing rosemary in open ground or in pots. Those in pots will require more watering and a light feed but that's about it. Growing in pots however is convenient because you can have one by your back or front door making harvesting so much easier. no variety of rosemary is fully frost hardy and all varieties can be killed by very severe frosts. Some can be killed by light frosts. See the section below on frost hardiness for more specific details. Growing rosemary in pots gives you the ability to move the plants to a frost free position for a few days if a bad frost is predicted. rosemary prefers a light soil in full sun, plants grown in standard multi-purpose compost do well and they can always be positioned in full sun. If you are growing in open ground and your soil is heavy then prepare it well to lighten the soil and give good drainage. rosemary grown in open ground almost looks after itself. Only in the very driest conditions will it ever require watering. In open ground there is no need to feed the plant, it will extract sufficient nutrients from all but the very lightest of soils. As you can see from the above if you choose a hardy variety of rosemary, prepare the soil well and position it in mainly full sun, both pots and open ground cultivation work well. If you have problems with heavy soil or want to grow a less frost tolerant variety then it's probably best to grow this herb in pots. Before we answer that question it's crucial to understand that the primary environmental enemy of rosemary is an over-wet soil and this is especially the case in winter when more rain falls. If your soil is free draining and relatively light then most varieties of rosemary are frost hardy down to -8°C / 18°F, many to much lower temperatures. If your soil is even slightly water logged then any temperature below freezing will probably damage or kill your rosemary plant. Another key factor in how frost hardy a rosemary plant will be is how exposed the site is. Those subject to strong winds will be less frost hardy compared to those in protected positions. Before planting a new rosemary plant make sure the soil conditions and the position are correct. They thrive in a light, well-drained soil. If your soil is heavy or clayey then dig in lots of well composted organic material and ideally some horticultural sand. Dig it in deeply because after a few years your rosemary plant will put down extensive roots. Choose a position which is is in full sun for 6 hours of the day at the very least. Planting is simply a matter of digging a hole slightly larger than the roots, put it in position to the same depth as was in the post and fill in with soil. Firm down gently and water in. Do not feed the plant at all. The eventual size of the bush, if allowed to grow freely, will be about 50cm / 3ft wide so take this into consideration when planting. Regular pruning can easily keep the plant to around 30cm / 2ft wide with out any problems. Caring for a rosemary plant growing in open ground is minimal. Keep the area around the bush free from weeds and prune as explained below. If the soil is normal then no feeding is required. In very poor, soil feed twice a year with a balanced fertiliser such Blood, Fish and Bone. Once a rosemary bush is established they require very little attention but an annual prune in late winter to early spring will extend its productive life considerably and keep it looking good. If you look at the lower part of an established rosemary bush you will see that it is woody and no foliage is sprouting from the lowest part of the plant. As time goes by, if the bush is not pruned, that non-productive woody part will extend higher up the plant. An annual prune won't stop the woody part extending up the plant but it will greatly slow it down. There's no complicated pruning rules with rosemary, simply cut back the top third of the plant (never into old non-productive wood) with a pair of shears or pruners. Then generally cut the plant to shape. Rosemary will withstand very hard pruning if overgrown as long as you don't cut below productive wood into non-productive wood. That's it, job done! Many people save the prunings by drying them in a cool and dark place (a shed or garage is ideal) and then use some of them on their barbecues. The aroma or burning rosemary leaves and branches is superb and it goes well with lamb and chicken in particular. Many veggie dishes are improved as well. A frost hardy variety which has blue to light blue flowers which are freely produced in May and June. The leaves are narrow, dark green on the top and dusty white underneath. It will grow to an eventual height and spread of 1.8m / 6ft but can easily be kept to half that size with annual pruning. The plant is compact and upright and can be used equally well as a specimen plant or as hedging. Excellent as a herb for cooking purposes. If you want a very hardy variety that can withstand low temperatures then this is the one to go for. The flowers are light blue with narrow green leaves on top and white below. Ideal for hedging or as a single plant. The scent of the crushed leaves is typical rosemary with a background of lemon, ideal for cooking use. If you want pink flowers on your rosemary bush then this variety is for you. The flowers are light pinks and there are lots of them. The thin leaves are green on the top with a white underside. This is an attractive plant as a single centre piece because the foliage is dense and upright. Height and spread are 1.2m / 4ft which can be reduced considerably with pruning. Needs a well drained and sunny position. Excellent for cooking purposes. At its fully grown stage this beetle is hard to miss even though it is small (8mm long at most). The red stripes down a metallic background clearly identify it. They feed on the tips of new shoots of rosemary plants causing them to shrivel and turn brown. They first become apparent in mid May time although they do most of their damage from mid to late summer. The beetles mate and lay eggs on the undersides of the leaves in August. The larvae then emerge in a week or two, have a munch on your rosemary for about three weeks and then fall to the ground where they overwinter. 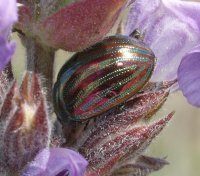 The proper name for this pest is Chrysolina americana which may give the impression that it originated in America. In fact it originates from Europe and has been common on South Eastern Europe and Mediterranean areas for many years. It was first spotted in the UK in 1994 and has steadily migrated northwards now reaching Wales and even as far north as Scotland. The larvae are much smaller, about 2mm long, looking like very small slugs with a black line down their back. They are normally found on the underside of young foliage. The plants can be sprayed but manually removing them is normally sufficient in the average UK garden because they are so obvious. Either pick the beetles and larvae off by hand or lay paper under the plant and shake them off onto the paper then dispose of them. Encourage birds into the garden because they will eat the larvae. As well as rosemary (their favourite plant) they can also be be found on lavender and sage. This pest can cause problems at its larvae stage. It is easily identified as a white froth on young stems. The froth is generated by the larvae to protect them from birds. They first appear in May and can last up to July. The cure is simple, spray them off with a jet of water as soon as you notice them. The name cuckoo spit refers to time of year when this pest first appears although it has nothing whatsoever to do with cuckoos. When the larvae hatch a leafhopper will emerge which is harmless to rosemary plants. 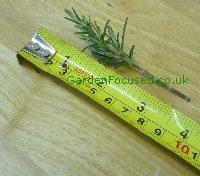 Rosemary is one of the easiest plants to take cuttings from, an ideal subject for even the very most amateur of gardeners. All you will need is a number of pots (about 8cm diameter is ideal) some general purpose potting compost and a sharp pair of secateurs or knife. Rosemary cuttings can be taken literally at any time of the year because they are never dormant. However the best time is probably between late March to mid September avoiding their flowering period which is normally mid May to late June. If you take the cuttings in winter or autumn they will certainly grow but they may take a little longer with the shorter days restricting their vigour. Personally we find the best time of year is early to mid September because this avoids the gardeners busy part of the year when other crops need attention. We use multi-purpose potting compost and it works fine for us. Some sources recommend buying special cuttings compost which is slightly lighter and drains more easily. Certainly this will also work fine. Soil from your garden is definitely not recommended, it is likely to be too heavy and will have various bugs and pathogens in it which are not good for taking cuttings. 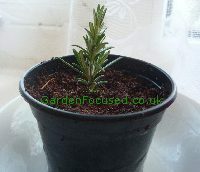 Because rosemary is so easy to propagate from cuttings we suggest placing one cutting in each 8cm pot. Almost all will grow and it will avoid potting them up. Fill the pots with the compost to about 2cm from the top and gently firm the soil down. Use a pencil or similar to make an 8cm / 2½in hole in the compost where the cutting can be inserted. We don't use hormone rooting powder when taking cutting because previous experience indicates it makes no difference. However, if you wish to use some then simply dip the end of the cutting into the powder and shake any excess off just before placing the cutting in the compost. The initial cutting should come from the top half of the plant and should be about 10cm / 4in long. It should have leaves growing well from the entire length of the stem. Use a sharp knife or secateurs to make the cut and avoid crushing the stem. Strip off the lower leaves leaving only the top 5cm / 2in with leaves on. Pull off the leaves one at a time to avoid damaging the stem. Place the cutting on a hard surface and cut the bottom of the cutting again just below a leaf node (the tiny lumps in the stem where a leaf joins the stem). Place the cutting in the hole in the compost so that the lowest leaves are barely above the level of the compost. Gently firm the compost around the cutting to support it and ensure the stem is in contact with the compost. Water well and let the excess water drain away. Place the pots in a light position but out of direct sunlight. A window sill will do fine for this purpose. The cuttings will root where the soil temperature is between 12°C / 54°F to 22°C / 72°F. the higher the temperature within that range the quicker the cuttings will root. Leave the cuttings for six weeks only watering if the compost is not moist. After six weeks any cuttings which have failed to root will be clearly dead, any which are still green can be assumed to have rooted. The new plants should be transferred to larger pots when the roots have filled the original pot. At this point gradually acclimatise the plants to outside weather conditions (leave it to later if there is a danger of frost) and they can then be placed outside. The classic use of rosemary is with roast lamb. Sprigs of rosemary are pierced into the meat surface before it is cooked. During the cooking process they add delicious flavour to the lamb and are can also be added to the gravy. 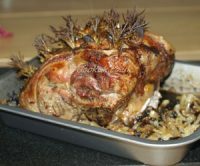 Not only is the flavour added by rosemary superb, the roast lamb looks very impressive when taken from the oven. Other recipes which make excellent use of rosemary include lamb and feta burgers, chicken with grapes and rosemary and delicious rosemary and garlic potatoes.